Hello, my name is Amanda and I am a pin-aholic. Every time I go to Pinterest to look at my Boards and actually read the instructions to make something that I have pinned I get sidetracked by all of the cool stuff my friends have pinned, and before I know it an hour has flown by and I have accomplished nothing. I put a stop to the madness this weekend and actually managed to try something I have pinned. 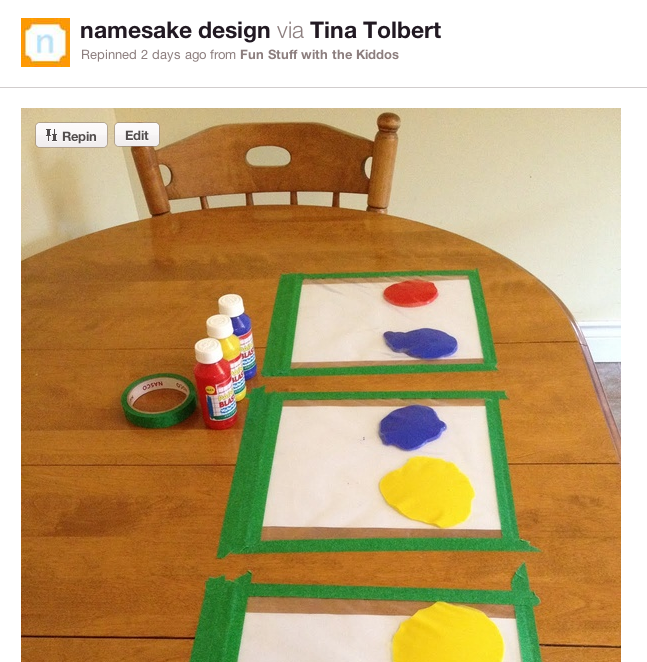 This mess free project was originally pinned from a blog called the The Hippie Housewife. Overall the project delivered. It was mess free, easy to set up, and kept my toddler occupied (and clean) for a period of time. Although she liked it, she immediately got out her paint brush and tried to move the paint around under the plastic with it. She was not very successful. She also kept saying "I want to paint". I don't think she bought it when I told her this was painting. It was also hard for her to make any lines in the paint, I had to press pretty hard to make visible lines in the paint. The fact that she couldn't "draw" in the paint caused some frustration. All in all it was an easy project and fun project, and it kept us entertained for at least 30 minutes of a rainy day. Next time I set it up I will hide the real paint and brushes so that my daughter doesn't keep pleading to "paint with brush". This would also make a good project for a long road trip. You could tape the bags onto particle board cut to size to make them portable. I've had this one pinned for a while too :) Paint and playdoh are 2 things we just don't do around here b/c I hate the mess. Maybe I'll give this a try. Thanks for the quick review of the idea!